Jumping Spiders are mostly black with a conspicuous white, orange, or red triangular patch in the center of its abdomen. Take a close look at this spider’s chelicerae (jaws), as they have a gorgeous, iridescent sheen to them and come in a variety of colors! Though they can jump relatively long distances, they pose no threat to humans due to their small size. Grass spiders spin dense, non-sticky, sheet-like webs with a funnel-like retreat where the spider hides. Banded garden Spiders can be found in gardens, orchards, forest edges, old fields, and farms, they spin a classic round orb web which is often quite symmetrical. The Long-legged Sac Spider is commonly found indoors, where it prowls walls and ceilings at night, looking for prey or mates. The Woodlouse Hunter does not spin a web, but hunts “on foot,” sometimes straying indoors. Wolf Spiders hunt actively at night, or wait in ambush at the mouth of its burrow, where it hides during the day. Adult males may wander indoors during mating season. Crab Spiders like to prowl vertical surfaces like shrubs, trees, and the exterior walls of buildings. They do not spin a web to catch prey, but easily overpower most insects. Common House Spiders‘ teardrop-shaped, papery brown egg sacs can aid in their identification. The spider’s color and body shape cause them to be mistaken for “brown widows” on occasion. Long bodied cellar spiders can be found on ceilings, in basements, storage sheds, old wells, caves, and other dry locations with low light. The Funnel Web spider is often confused with the infamous Brown Recluse but is perfectly harmless to humans. They can often be found in the dark corners of homes and can easily be identified in association with the carefully designed funnel pattern webbing. Black Widow The venomous bite of these spider species is considered dangerous however, bites rarely kill if proper medical treatment is provided. severe muscle pain, abdominal cramps, hyperhidrosis, tachycardia, and muscle spasms. Female Widows are dark or black in color usually exhibiting a red or orange hourglass on the underside or bottom of the abdomen — some may have a pair of red spots or have no marking at all. They often exhibit various red or red and white markings on the dorsal or top side of the abdomen, ranging from a single stripe to bars or spots.Juveniles and adult male Latrodectus are half the size of the females, and are often grey or brown and usually lighter in color than females; while they may sometimes have an hourglass marking on their ventralabdomen, it may be yellow or white, not red. They construct a web of irregular, tangled, sticky silken fibers. The spider very frequently hangs upside down near the center of its web and waits for insects to blunder in and get stuck. The Brown Recluse is very rarely, if ever, seen in Colorado due to the cold and dry environment. The occasional recluse may be unknowingly transported from other states but cannot remain established for an extended period of time. This arachnid can be identified by the violin shaped marking on its cephalothorax and is not to be confused with the wolf, funnel web, or grass spiders which are harmless. Though spiders are an important part of the ecosystem and regulate the population of other pests, we often consider these creepy crawlies as nuisance. Occasionally we may even encounter those that could cause a medical emergency. 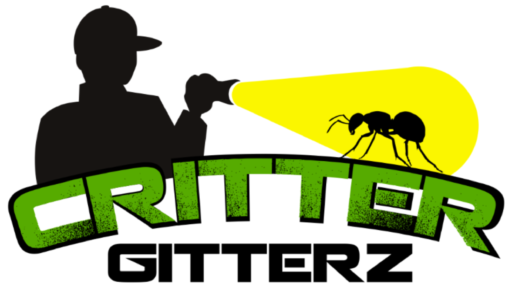 If you wish to have these critters removed from your home, give us a call at 303-973-0333 or email at CritterGitterz@gmail.com.